Before boarding flight to New York, Prime Minister pens message: Jewish people surmounts all obstacles. Prime Minister Binyamin Netanyahu addressed a letter to the citizens of Israel Wednesday just before he boarded a flight to New York, where he will address the UN General Assembly. In it, he castigated the UN delegates who chose to remain in the UN General Assembly hall as Iran's President Mahmoud Ahmadinejad spoke there earlier in the day. "Dear Israeli citizens," he wrote. "I am taking off tonight to New York, to represent the State of Israel on the UN podium. On the question of Iran, we are all united in the goal of preventing Iran from obtaining nuclear weapons." "On the day that we pray to be inscribed in the Book of Life, the podium was given to the dictatorial regime in Iran that takes every opportunity to sentence us to death." "On the eve of Yom Kippur, a day that the Jewish people holds sacred, the Iranian dictator chose to call for our disappearance in public, with the entire world watching. This is a black day for those who chose to remain in the hall and hear these hateful words. In my speech before the representatives of nations at the UN General Assembly, they will hear our response. 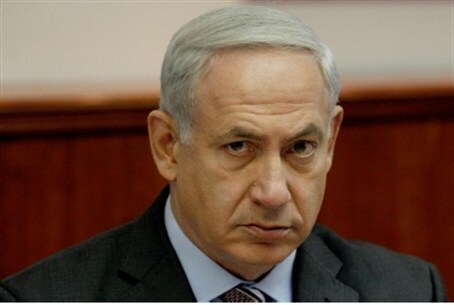 "As the prime minister of Israel, the state of the Jewish people, I am acting in every possible way so that Iran does not obtain nuclear weapons. History proves that whoever wanted to erase us from the map – failed in his mission, while the Jewish nation overcame all obstacles. "We've created a marvelous state, one of the most advanced in the world. Israel is a modern, strong state due to the strength and talent of its citizens and thanks to our belief in the justness of our path. I wish you a gmar chatima tova."